Welcome to the Fort Worth ENT Hearing Aid Center, where our physicians and audiologists specialize in the treatment of audiology and hearing loss. Ear, Nose, and Throat (ENT) physicians or otolaryngologists are trained in the medical and surgical treatment and diagnoses of problems with the ear. Conductive hearing loss is caused by anything that prevents sound waves from reaching the inner ear. 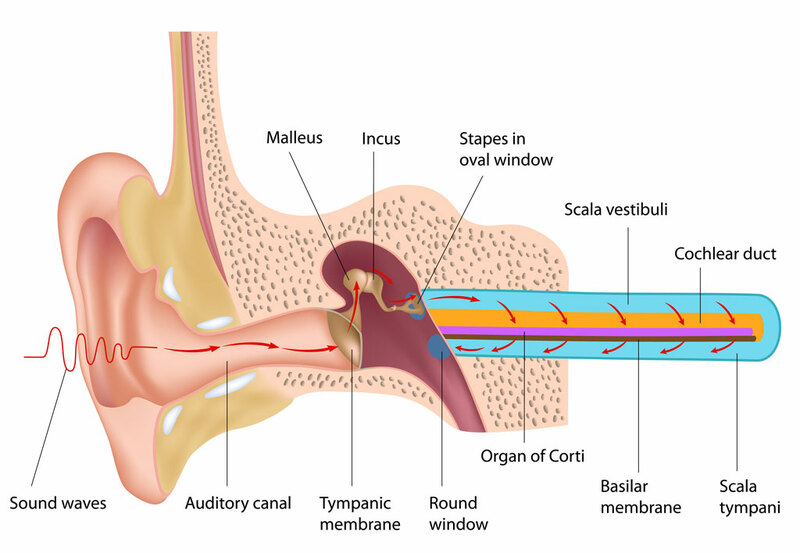 This may be something as simple as a build-up of wax in the ear canal, or it could be as serious as otosclerosis (a condition associated with a stiffening of the small bones in the middle ear). Other causes may be a narrowing of the ear canal (stenosis), complete absence of the canal (atresia), perforated ear drum, or a build-up of fluid in the middle ear (prevents the small bones vibrating). Generally, conductive hearing loss can easily be treated medically or surgically. For residual hearing loss once optimal treatment has been administered, hearing aids can be effectively used to promote better hearing. Sensorineural hearing loss is usually the result of inner ear or neural damage, the cause of which is often difficult to determine. Unfortunately, this hearing loss is often irreversible. Recognized causes may be inherited/genetic, certain disease processes, aging (presbycusis), noise trauma, and the side effects of certain medications. Essentially, all sounds are diminished and speech may sound fuzzy. When this occurs, certain sound pitches may become difficult to detect, and you may not be able to understand key words in a conversation (which can make communication and socializing with others quite difficult). Age related hearing loss (presbycusis) usually doesn’t become a problem until the 50’s. Treatment is usually with hearing aids. Mixed hearing loss is usually a combination of both sensorineural hearing loss and conductive hearing loss. The doctors at Fort Worth ENT will be able to determine the type of hearing loss that you have and will be able to make appropriate treatment recommendations. An audiologist is a healthcare professional, usually with a master’s degree or more, trained to help diagnose and monitor hearing and balance disorders. They have extensive knowledge of ear anatomy, physiology and pathology and a wide experience with hearing aids and protective ear molds. Our audiologists work hand-in-hand with our ENT specialists to provide patients with the most comprehensive, state-of-the-art medical care. If you have questions concerning audiology and hearing loss or would like an appointment with one of our physicians at Fort Worth ENT & Sinus please complete an online appointment request or phone 817-332-8848.